Huawei gives us a sneak peek of the upcoming Mate line with the new Mate 20 Lite, revealed at IFA 2018. Here's what we think after testing it out in person. Should I buy the Huawei Mate 20 Lite? The Mate 20 Lite is a difficult phone to place. It looks attractive enough, if not exactly striking, and offers decent mid-range performance while falling short of the flagship processors found in similarly priced Honor phones. All of that would make for a solid mid-range business phone, but the emphasis on the selfie cameras throws things off. This isn’t an exciting enough phone for the Snapchat crowd, while business users can get better performance for less money elsewhere, making this a phone that doesn’t really have an obvious audience. With Huawei fans eagerly awaiting the launch of the Mate 20 and Mate 20 Pro, the company has whet their appetites with the Mate 20 Lite, the cheapest member of the new line, which was revealed at IFA 2018 and released shortly after - more than a month ahead of the other two phones. It’s a slightly odd strategy, but one that probably serves the Mate 20 Lite itself quite well, as it’s freed from comparisons to faster (and pricier) siblings and instead gets its own time in the spotlight. That doesn’t save the phone from comparisons to the rest of the mid-range market though, and the Mate 20 Lite can’t quite keep up with the competition. The Mate 20 Lite is out now in the UK. It’s on sale at Carphone Warehouse, Vodafone, Amazon, and Currys for £379, with contracts currently available from £21 per month with no upfront cost. As with all Huawei phones, it's not getting a US release. That price is £50 more than the recent P20 Lite, and puts the Mate 20 Lite directly up against the £399 Honor 10 - currently our pick for the best mid-range phone around. That’s stiff competition, and the Mate 20 Lite will have its work cut out for it making a dent in the increasingly crowded mid-range market. Following on from the P20, it’s no surprise to see that the Mate 20 Lite boasts a big, notched display - though it’s actually a slightly wider notch, a necessary change to cram in dual selfie cameras. The rest of the design is pretty typical for 2018 really. With an 81 percent screen-to-body ratio, Huawei has kept the build fairly condensed despite the 6.3in display, measuring 158x73mm - and just 7.6mm thick. The rear of the phone is glass, and features another two camera lenses in the centre, bordered by the trademark Mate brushed metal stripe. Despite the glass there’s no wireless charging here, nor is there any waterproofing, but you do at least get a headphone jack. It’s only available in blue or black, which adds to the sense that the design here is mostly functional. That’s not to say it’s an unattractive phone, but it’s a far cry from the colourful, design-led P20 range. That’s in keeping with the Mate’s usual focus on business customers but is a bit strange given that Huawei is actually pushing the new Lite as a selfie phone, with a younger demographic in mind. Right, so that’s what the Mate 20 Lite looks like - let’s get into the nitty gritty specs stuff now. First up, that big 6.3in display. It’s Full HD+, clocking in at 1080 x 2340 in a 19.5:9 aspect ratio, which means it manages a very respectable pixel density of 409ppi. It’s an LTPS LCD display, which makes sense for the price, and it looks great in person, with solid colour range and contrast. It’s bright too, with a maximum brightness of 405cd/m2 - one of the higher scores we’ve seen, especially at this price point. Here’s where things get more interesting. The Mate 20 Lite is the second phone powered by Huawei’s Kirin 710 chip, an octa-core processor with four cores running at 2.2GHz and another four running at 1.7GHz. It’s likely a far cry from the performance of the Kirin 980 - which we expect to underpin the Mate 20 and Mate 20 Pro - but it offers solid mid-range performance, especially paired with 4GB of RAM as it is here. As for storage, it comes with 64GB built-in, expandable with microSD up to another 256GB. We’ve sadly been unable to properly benchmark the phone, as it stubbornly refuses to install any of our usual benchmarking software - though don’t worry, it’s installing other apps just fine. In real world usage though it’s pretty zippy, as we’ve really come to expect from any mid-range device now. The Kirin 710 is clearly fast enough to handle day-to-day phone tasks with ease, but it does begin to struggle and slow if you pit it up against more demanding stuff like gaming - even with support for Huawei’s GPU Turbo optimisation tech. Still, you can get the substantially more powerful Kirin 970 in the Honor 10 for the same price or in the Honor Play for £100 less (admittedly with a bit of a downgrade to the cameras) the Mate 20 Lite probably isn’t the phone to go for if performance is your top priority. As we mentioned earlier, you get a headphone jack (hooray! ), along with USB-C for charging and data transfer. There’s also Wi-Fi and Bluetooth (but only version 4.2, not the more recent and reliable 5.0), though sadly no support for NFC, which rules out using Google Pay. As for security, there’s a fingerprint scanner on the rear of the phone, or you can use the dual selfie cameras for face unlock, which will now work no matter what angle you hold the phone at, meaning you can use face unlock in landscape mode. The cameras are what Huawei is really pushing with the Mate 20 Lite, especially the front-facing ones, seemingly in an effort to expand the Mate brand beyond business users. The dual selfie lenses are 24MP (f/2.0) and 2MP, with the latter primarily intended for depth sensing to pull off the bokeh effect. That’s an awful lot of camera just for selfies, and it’s naturally backed up by a suite of AI-driven software stuff, including automatic (optional) beautification, AR overlays, animated emoji, and portrait lighting. Huawei is even packing in every possible way to take a photo, with options to take a shot by tapping on the screen, smiling, or using gesture controls. To show off its commitment to the selfie, Huawei has actually packed more megapixels into the front of the camera than the rear - on the back you just get 20MP for the main lens and a similar 2MP backup, though the lower f/1.8 aperture might give the rear camera the edge. Selfies are impressive to be fair, with crisp, detailed portrait shots and bright colourisation with a bit of help from the AI mode. The main shooter isn’t bad, but it’s nothing too special either - and while it handles low light fairly well, as you can see in the gallery above it struggles more in complex lighting environments like a gig. AI stuff has been amped up here too. The now familiar scene recognition is back, automatically adjusting settings and apply post-processing depending on whether the photo is of a dog or a sunrise, but Huawei has added four new scenes to bring the total to 22 - though we do question how much use you’ll get out of additions like ‘ancient building’ and the genuinely baffling ‘panda’. 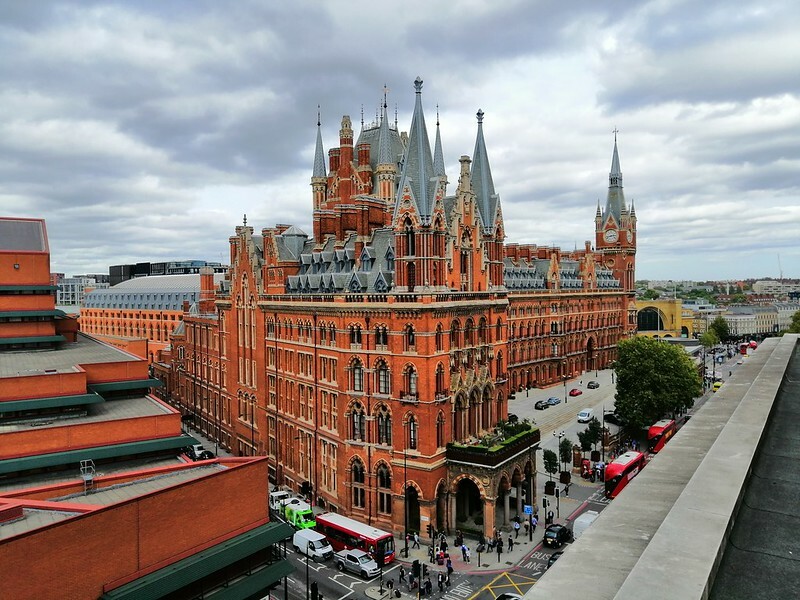 The AI photography can be a bit unpredictable though - the two shots of the St. Pancras building in our Flickr gallery were taken immediately after one another, but as you can see the AI settings processed them differently, with contrasting results. Huawei is also bigging up the phone’s battery life. With a 3,750mAh battery inside it lasts a while, with Huawei claiming that the average user will get 2.3 days out of it, with even a heavy user lasting 1.5 days. That’s not too far off what we’ve seen in our usage. We just about stretched it past the 2-day mark once, but for the most part we were ready to reach for our charger towards the end of the second day. Either way, you’d have to work hard to empty the battery over a single day, which is probably what matters to most people. Along with Android 8.1, the Mate 20 Lite ships with Huawei’s EMUI 8.2 skin. Manufacturer Android skins are always a bit of a thorny issue, and EMUI has its fair share of detractors. It does give you a decent amount of control though, and there are a few design choices gently borrowed from Apple that make it an easy transition for anyone coming from an iPhone. The new additions in version 8.2 are fairly minor, and mostly the sort of AI tweaks we’ve already discussed like scene and object recognition (now expanded and improved in the gallery app too), improved automatic switching between 4G and Wi-Fi depending on signal strength, and the option to hold down on an image of a product to automatically find it on Amazon.